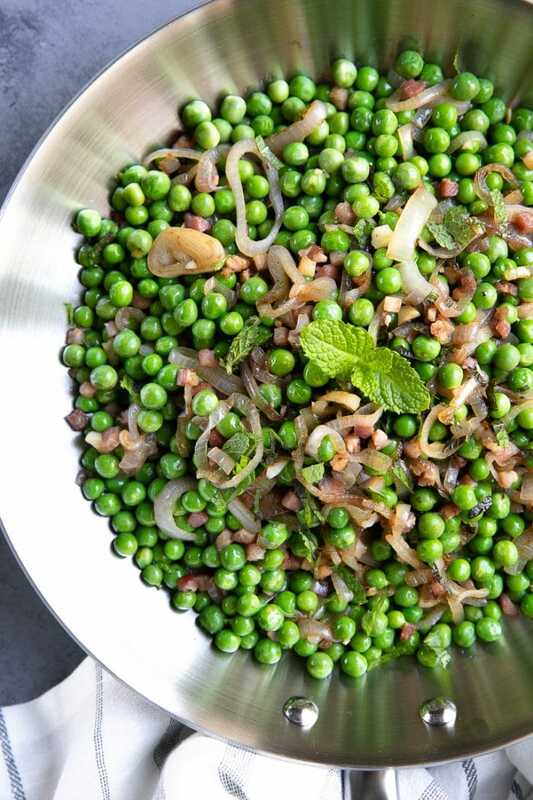 Peas and Pancetta– a delicious and easy holiday side dish made with peas, shallots, pancetta, and fresh mint. 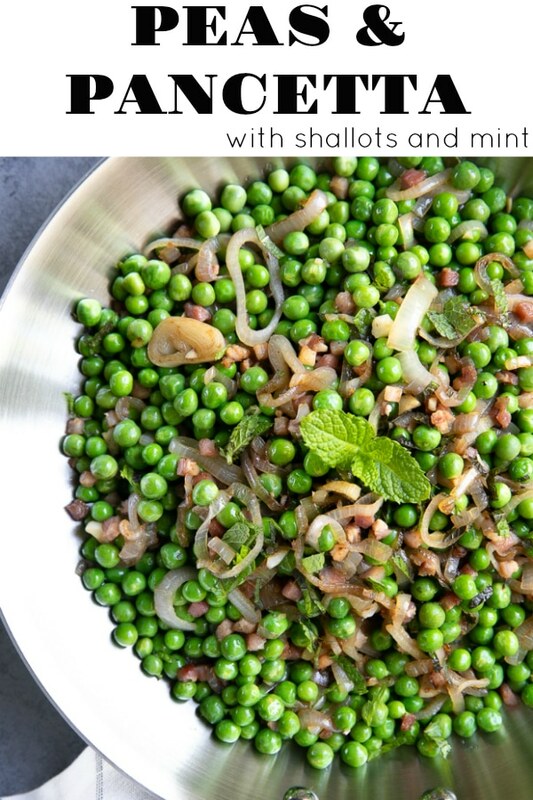 You can easily prepare the shallots and pancetta ahead of time, reheat with the peas, and turn this already easy holiday side into one even easier. There is something very familiar and comforting about peas. I remember growing up eating this humble vegetable…or is it a fruit?…no wait, it’s a legume… guys, I don’t know. Anyway, I remember eating frozen peas covered in salt and butter at least once a week all through my childhood. 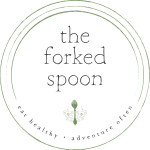 …annnnd I think I just discovered where I developed my sweet and savory obsession. 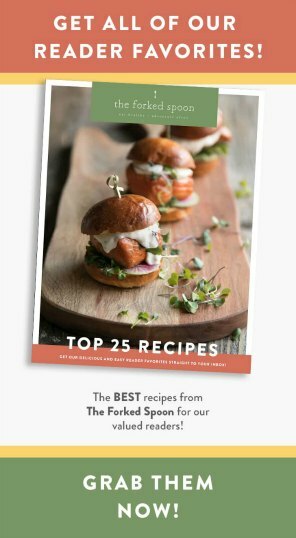 Anyway, big fan of sweet peas, I was instantly attracted to this Peas and Pancetta Recipe by Ina Garten. Filled with simple ingredients like peas, shallots, and pancetta, the combination of sweet, savory, and salty was almost too good to be true. To start this recipe you first need to heat the olive oil in a large skillet and add the shallots and the pancetta. Sauté until the pancetta is browned and the shallots are soft and tender. Stir the pancetta and the shallots often to prevent burning. Add the peas, salt, and fresh black pepper, and mix well. Continue cooking just until the peas are hot, approximately 4-5 minutes. Season to taste and stir in the fresh mint to garnish. 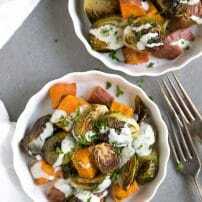 In the original recipe by Ina Garten, she uses frozen peas. Frozen peas are obviously beneficial for many reasons including convenience. 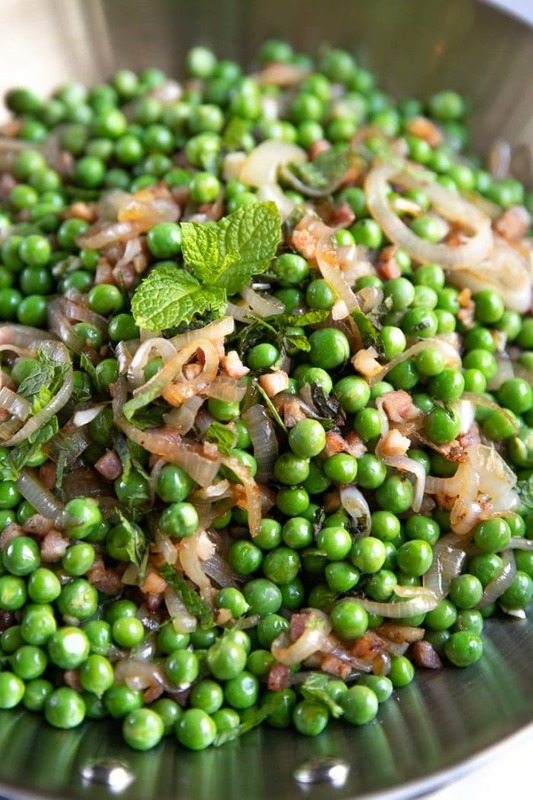 However, this recipe can be made with fresh or frozen peas. 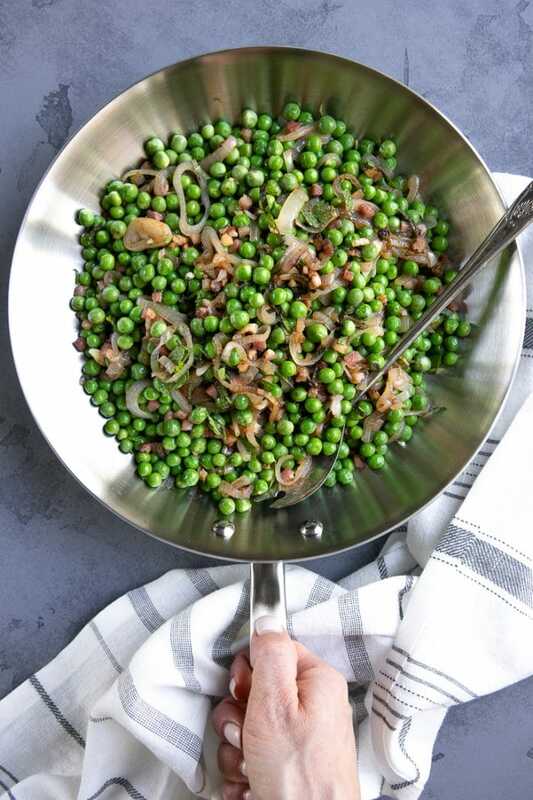 To prepare Peas and Pancetta with fresh peas, I recommend blanching the peas in boiling water for one minute, followed by an ice water bath to stop cooking before you add them to the skillet with the shallots and the pancetta. I have found from personal experience that the peas turn out brighter and have a better consistency than if you skip the blanching. 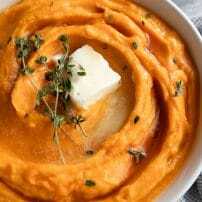 So, what is blanching? When you blanch a vegetable, you are essentially boiling it for a very short amount of time- in this case, just 1-2 minutes. You immediately drain the boiling water and transfer the vegetables to an ice water bath (aka bowl filled with ice water) and drain again. Blanching helps remove enzymes which cause bitterness. Blanching also enhances color. 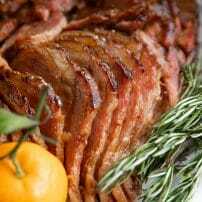 DON’T FORGET TO PIN THIS PEAS AND PANCETTA RECIPE TO PREPARE FOR YOUR FAMILY ON THANKSGIVING, CHRISTMAS, EASTER, OR ANY OTHER TIME YOU NEED TO MAKE AN EASY SIDE DISH. 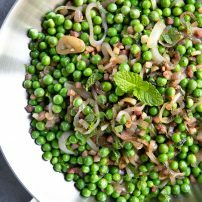 Peas and Pancetta- a delicious and easy holiday side dish made with peas, shallots, pancetta, and fresh mint. You can easily prepare the shallots and pancetta ahead of time, reheat with the peas, and turn this already easy holiday side into one even easier. Heat the olive oil in a large skillet over medium-high heat. Once the skillet is hot, add the pancetta and shallots and sauté until the pancetta is browned and the shallots have softened approximately 5-6 minutes. Stir often to prevent burning. 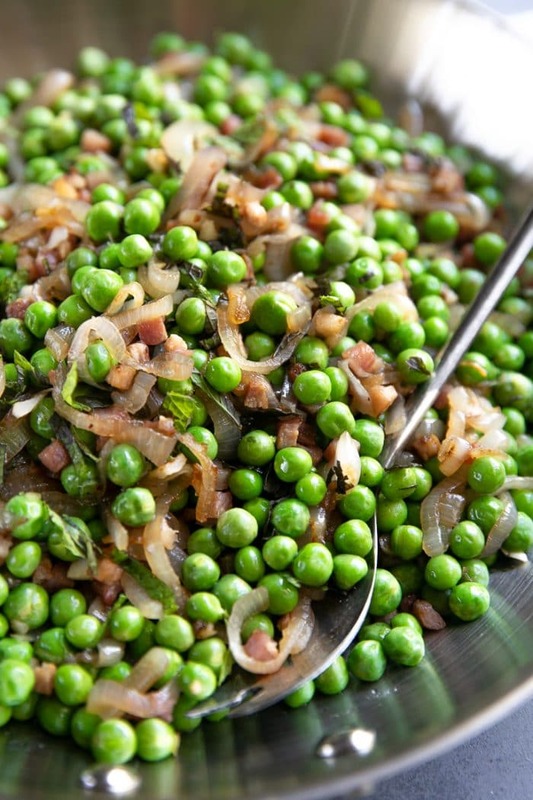 Add the frozen or blanched fresh peas to the skillet with the pancetta and shallots. Stir well to combine. Cook for approximately 4-5 minutes, or until peas are hot and cooked to desired doneness (avoid overcooking as they will wrinkle and shrink). Remove from heat. Stir in the black pepper, salt, and fresh mint to taste. Enjoy. If you are using fresh peas, I recommend blanching them in boiling water for 1 minute before adding to the pancetta and shallots. To do this, bring a pot of water to boil. Add the peas and boil for one minute. Drain the peas and immediately transfer to a bowl filled with ice water. Drain again. When ready, add the peas to the skillet and cook according to recipe instructions.